There was a wedding at Cana in Galilee, and the mother of Jesus was there. Jesus and his disciples were also invited to the wedding. When the wine ran short, the mother of Jesus said to him, “They have no wine.” And Jesus said to her, “Woman, how does your concern affect me? My hour has not yet come.” His mother said to the servers, “Do whatever he tells you.” Now there were six stone water jars there for Jewish ceremonial washings, each holding twenty to thirty gallons. Jesus told them, “Fill the jars with water.” So they filled them to the brim. Then he told them, “Draw some out now and take it to the headwaiter.” So they took it. And when the headwaiter tasted the water that had become wine, without knowing where it came from –although the servers who had drawn the water knew- the headwaiter called the bridegroom and said to him, “Everyone serves good wine first, and then when people have drunk freely, an inferior one; but you have kept the good wine until now.” Jesus did this as the beginning of his signs at Cana in Galilee and so revealed his glory, and his disciples began to believe in him. “The miracle of our Lord Jesus Christ changing water into wine, certainly is not strange for those who know that God did it. 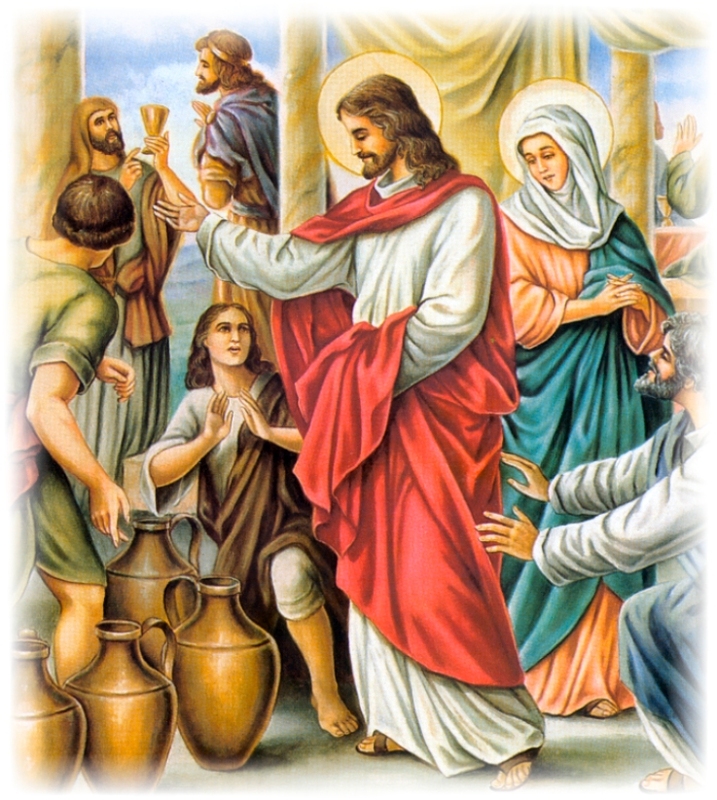 In fact, on that day at the wedding he made the wine in six stone water jars, he who commanded that they fill the same with water as he does every year in the vineyards. In reality, as what the servers put in the stone jars became wine by the Lord’s act, so too what the clouds pour out become wine also by an act of the same Lord. Well then, of this we are not amazed because it happens every year; by assiduity it has lost the element of wonder. Certainly, it gains greater attention than that gained by what happened to the water in stone jars. In effect, who is there that considers the works of God who rules and governs the whole world, and is not amazed and overwhelmed by the miracles? But because men are attentive to another thing and have lost the consideration of God’s works through which they could daily praise the Creator, God has reserved for himself, we might say, certain unusual events to awaken the sleeping men through marvelous acts so that they may adore him. Because he was invited, the Lord came to the wedding. Is there anything strange that he would come to that house to the wedding he who came into this world for a wedding? In reality, if he did not come to a wedding, he does not have a bride here. Therefore, he has here a bride whom he redeemed with his blood and to whom he gave the gift of the Holy Spirit. He snatched her from the slavery to the devil: he died for her sins and rose for her justification. Who would offer so much for his bride? Men can surely offer earthly honorable titles, gold, silver, precious stones, horses, slaves, properties, and farm lands; will someone offer his blood? In fact, if he would give his blood to his bride, he could not marry her. On the other hand, the Lord, on dying, gave his blood for her whom he will surely possess upon rising, to whom he had been united in the womb of the Virgin. In fact, the Word is the groom and the human flesh the bride. He himself is both the only Son of God and also the Son of Man. From where he became the Head of the Church was the womb of the Virgin Mary, his nuptial chamber; from there came out the Groom as from his nuptial chamber, as the Scripture foretold: And he, comes forth like a bridegroom coming from his chamber, rejoices like a champion to run his course (Ps 19:6). He came from his chamber as a groom, and invited he came to the wedding. Why then does the Son tell the Mother: Woman, how does your concern affect me? My hour has not yet come? Our Lord Jesus Christ was God and man; as God he had no mother, as man he had. She was, therefore, mother of the flesh, mother of the humanity, mother of the weakness that he assumed for us. On the other hand, the miracle that he was to perform, he was to do it according to the divinity, not according to the weakness; in so far as he was God, not in so far as he was born weak. But the weakness of God is stronger than men. The mother, therefore, wanted a miracle; but he, who was to perform divine works, seems not to recognize the human womb, as if saying: “You did not beget what in me performs the miracle, you did not beget my divinity; but because you begot my weakness, I will know you when that very weakness hangs on the cross.” This, in fact, means “My hour has not yet come,” since he knew her who absolutely had always known her. And before being born of her, in predestination he had known his mother; and before he as God would create her from whom as man he would be created, he had known the mother. But mysteriously, at a certain hour he does not know her, and inversely, mysteriously, at a certain hour that had not yet arrived, he knows her. He knew her, in effect, at the moment when he whom she begot was dying. Certainly, that by whom Mary had been created was not dying, rather what had been created from her was dying. The eternity of the divinity was not dying, rather the weakness of the flesh was dying. Therefore, he answered to distinguish according to the faith of believers, who and from where he had come, since through a woman mother came God the Lord of heaven and earth. In so far as he is Lord of the world, because he is, Lord of heaven and earth, he is also Lord, yes, of Mary; in so far as he is Creator of heaven and earth, he is also Creator of Mary. On the other hand, as it is said: born of woman, born under the law, he is the Son of Mary. He the Lord of Mary, is the Son of Mary; he the Creator of Mary, is created of Mary (Jo. eu. Tr. 8, 1.4.9). “Jesus told them: ‘Fill the jars with water.’ And they filled them to the brim” (Jn2:7). How do you fulfill the will of God in your life? In the Wedding, there was need for wine and not water. How is your confidence in the power and the strength of God? Why is this advice of the Virgin Mary important? To do what Christ may tell us, one must listen to him. In what form can you listen to God and know his will? Contemplate Christ and Mary in the wedding feast at Cana and how Christ transforms water into wine. Ask God to transform your life into an offering pleasing to his eyes. Contemplate and adore. Contemplate following the words of the Virgin Mary: “Do whatever he tells you.” Spend this moment of prayer observing interior silence to listen and take in with love the voice of God. Lord God, Father Almighty, with pure heart, as far as our smallness permits, allow us to give you our most devoted and sincere thanks, begging with all our strength from your particular goodness, that by your power you may drive away the enemy from all our thoughts and actions; that you may increase our faith, govern our mind, give us spiritual thoughts, and bring us to your happiness, through your Son Jesus Christ, our Lord, who with you lives and reigns, in the unity of the Holy Spirit, God, forever and ever. Amen (en. Ps. 150:6). ← Obituary: Sr. Ma. Fortunata Gayumale Gaspillo, A.R.